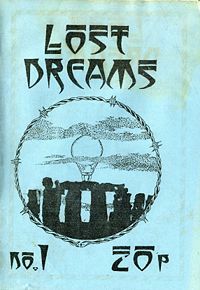 Lost Dreams - ZineWiki - the history and culture of zines, independent media and the small press. Lost Dreams is a set of four poetry and art zines by editors/authors: Ravenheart - Claire Leiper and Yan Tree. Issue one was published in late 1980's featuring Raven and Yan's poetry and artwork. Issue two by editors Ravenheart and Yan featured contributors from around the world, again mainly featuring artwork & poetry. Issue three, edited by Yan, again featured more contributors. Issue four, edited by Yan and Claire Leiper was the most punkest of the Lost Dreams zines, again featured contributors from around the world. It was completed in 1999. The name Lost Dreams comes from a lyric in a song by anarcho punk band The Mob. The first three zines were printed at Bobprint; in Blackburn Lancashire by Bob on recycled paper, and using coloured ink. Ravenheart also co-edited Peace of Mind zine with John Womble. The fourth one was a cut 'n paste zine printed by Andy of Bald Cactus zine from Leeds. http://punksishippies.blogspot.com/2009_11_01_archive.html has a downloadable link for various issues of the Lost Dreams zines ...and many, many others. This page was last modified on 5 January 2012, at 14:43.